Welcome back. Last Friday’s core dump on crocodilians (Crocodile News) certainly helped to reduce my files. I hope you won’t mind if I do the same with dogs. It’s not that my dog file is as overflowing, it’s more that I already referenced one dog study and both you and dogs deserve more than partial disclosures. Last May’s Animals and Touchscreens Addendum included a photo from a study of dogs’ ability to discriminate human expressions. For that study, investigators from the Messerli Research Institute and the Clever Dog Lab at the University of Veterinary Medicine, Vienna, trained 11 dogs to discriminate between images of 15 people’s happy and angry faces. The dogs saw only the upper or lower half of the faces. 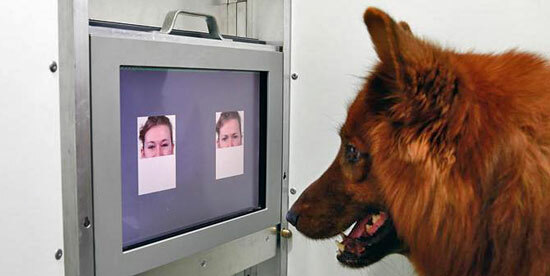 The dogs’ ability to discriminate happy and angry expressions was then tested using images of: (1) the other half of the faces used in training, (2) the same half but of unseen faces, (3) the other half but of unseen faces and (4) the left half of the faces used in training. The dogs performed significantly above chance with each of the four types of images. They had transferred their training to novel stimuli, using the emotional expression as the only distinguishing feature. Child eye-gazing with a dog. This study starts with oxytocin, a hormone that produces feelings of love and satisfaction and is linked to bonding and trust, such as that between mother and new born baby. Collaborators from Japan’s Azabu, Jichi Medical and Tokyo Health Sciences universities conducted two experiments using urinary oxytocin as a measure of bonding between humans and dogs. For the first experiment, urine specimens were collected from 21 pairs of dogs and owners before and after the owners petted, talked to and gazed at their dogs for 30 minutes. The oxytocin levels of both dogs and humans were higher at the end of the sessions, usually by comparable amounts for each dog and owner. Unexpectedly, however, eye contact raised oxytocin levels more than did either vocal or physical contact. For the second experiment, each dog was given a nasal dose of either oxytocin or an inert solution, then released into a room with the dog’s owner and two strangers. The three humans did nothing beyond meeting the dog’s gaze. The female dogs that received oxytocin gazed most at their owners, and their owners, in turn, showed the highest oxytocin levels. While it’s reasonable to expect female dogs to be more susceptible than male dogs, the male dogs’ responses might have been reduced by the presence of strangers. If those two studies didn’t make you rush out to get a dog, this one will. Researchers from Kyoto University and the Japan Society for the Promotion of Science examined dogs’ reactions to people who are and aren’t nice to their owners. Three groups of 18 dogs watched as their owners sat between an actor and a neutral person and tried unsuccessfully to open a box. -Dogs in one group saw their owners request and receive help from the actor. -Dogs in the second group saw their owners request but be refused help from the actor. -Dogs in the third group, the control group, saw the actor turn away in the absence of any request for help from the owners. 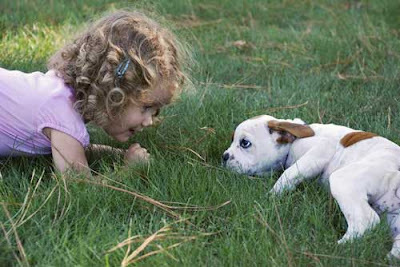 -All dogs saw their owners had no interaction with the neutral person. After each session, the actor and neutral person each offered a piece of food to the owner’s dog. After the “helper” and “control” sessions, the dogs chose food randomly, showing no preference for the actor or neutral person. But after the “non-helper” sessions, the dogs were biased against the actor, favoring the neutral person. I know. There are many reasons not everyone can have a dog. We had to opt for cats. Cats, of course, can do all those things dogs do--read your expressions, gaze into your eyes to bond with you, support you. Well, they probably can if they wanted to. Thanks for stopping by.